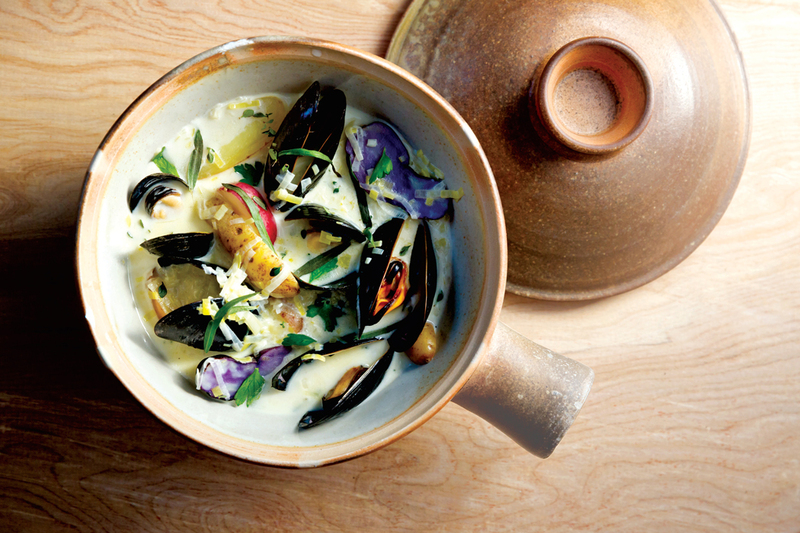 While mussels feature largely in this autumn dish, it’s the heirloom potatoes that inspired a warm bowl of tubers, shellfish, herbs, and decadent cream. Nowadays, at any local farmers market, you’ll find potato bins with names like “Bliss,” “Early Rose,” “Peach Cobbler,” and “Purple Peruvian,” among others. The best preparation for such a splendid array of spuds is the simplest: cut them in half lengthwise to show off their elegant flesh and varying shapes and then sink them into a bowl of chowder or lay them out sparingly on a sheet pan and roast them with plenty of kosher salt and savory herbs at a very high heat. Slow-cooked leeks and hardened garlic establish a robust base, and a finishing of green herbs and sea salt make for a simple, elegant chowder. In a medium Dutch oven, melt butter, then stir in leeks and a pinch of salt. Sauté over medium-low heat, softening leeks until they break down, about 15 minutes, stirring occasionally. Do not let them burn. Add minced garlic and cook for 5 more minutes. Add flour and, using a wooden spoon, disperse it to evenly coat leeks and garlic. Pour in wine, turn heat up to high, and bring to a boil. Reduce to a simmer and cook for 5 minutes, or until the alcohol is cooked off. Add fish stock and potatoes; simmer over medium heat until potatoes are tender, about 15 minutes. Stir in cream and thyme and simmer for 5 minutes more. Season with salt and pepper to taste. Remove from heat and set aside. Add an inch of water to a large lidded pot and bring it to a boil. Add mussels, cover, and boil over high heat for 3 to 5 minutes. If most mussels don’t open, shake pot and boil them partially covered for another minute or two. Once most mussels are open, turn off heat and remove lid. Do not overcook. Discard any closed or broken mussels. Place 5 or 6 mussels in each bowl. Pour the creamy potatoes on top. Season with sea salt and a twist of freshly ground pepper, then garnish with a smattering of tarragon and parsley.